Embedded Computing Design published an interview with our Marco Jacobs, talking about automotive ADAS, the adoption of Ethernet and its implications. Marco discussed how Automotive Ethernet is slowly but surely making its way into next-generation vehicle designs, and that increasingly those designs also include advanced safety systems that require minimal latency. For the camera systems associated with these advanced driver assistance system (ADAS) functions, the image buffering, encoding, and decoding requirements of Ethernet could potentially have negative consequences on these real-time systems, despite the technology’s increased bandwidth. The interview discusses the pluses and minuses of Ethernet, and explores video codecs and alternative architectures that can compensate for concerns around using automotive-grade Ethernet in active safety applications. The first AutoSens conference took place last year at the Autoworld vintage car museum in Brussels, a great location for an automotive conference. With more than 330 attendees, over 50 talks, and 20 exhibitors, all of them focusing on automotive sensing and processing, the event was a great place to learn and connect. You can read our show report here. There were many interesting talks at the show. About market analysis, processing technologies, sensor technologies, vehicle infrastructure, safety, and image quality. 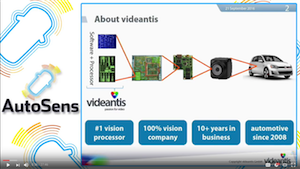 The conference organization has decided to upload all of the sessions from AutoSens 2016 to the public, for free, which includes our talk titled “Visual processing crucial to ADAS: applications, architectures and algorithms”. Watch our AutoSens presentation online. We will be joining Daimler, the PSA Group, Panasonic, Valeo, Nextchip, NVIDIA, ST, ARM at the IS Auto Europe conference in Düsseldorf, Germany on April 25-26. The full 2017 programme has been announced, and our Marco Jacobs will be speaking at the event, giving a talk about visual processing for automotive. Highlights from this year’s programme include sessions on sensor requirements for next-generation cars, new sensor technologies, sensor fusion, and covers everything from sensing to processing: from eyes to brain. The key event of the year for innovators who want to incorporate visual intelligence into their products. Come meet us at the Santa Clara Convention Center on May 1-3, and connect with hundreds of product and application developers, business leaders, investors and entrepreneurs – all focused on embedded vision. We will give a presentation about 360-degree video systems that use multiple cameras to capture a complete view of their surroundings. These systems are being adopted in cars, drones, virtual reality, and online streaming systems. At first glance, these systems wouldn’t seem to require computer vision since they’re simply presenting images that the cameras capture. But even relatively simple 360-degree video systems require computer vision techniques to geometrically align the cameras – both in the factory and while in use. Shortly after TensorFlow celebrated its first birthday last year, Google’s team in February announced version 1.0 at its TensorFlow Dev Summit conference. This open-source numerical computation framework for deep learning has seen rapid adoption in our quickly moving industry. The new features in TensorFlow center around speed, flexibility, and production-readiness. Stephen Hawking is quoted as saying: “The development of full artificial intelligence could spell the end of the human race.” Elon Musk, Steve Wozniak, and others have also expressed similar concerns. The fear is that super-intelligent machines will pose an existential threat to humanity, for example, keep humans as pets or kill us all. This article argues that any AI threat will not come from machines that are too smart, but from machines that are too dumb. Roborace finally pulled the wraps off its first real self-driving racecar. The British company behind the series showed off its Robocar for the first time ever in public during a press conference at the Mobile World Congress in Barcelona. The car has many sensors: 5 LIDAR, 2 radar, 18 ultrasonic, 2 optical speed sensors, and 6 cameras. IS Auto EU April 25-26, Düsseldorf, Germany Meet us and see our talk at this automotive sensing event. 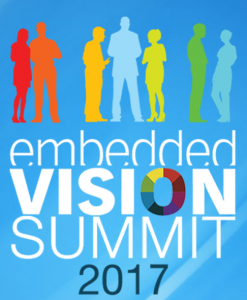 Embedded Vision Summit May 1-3, Santa Clara, California Come see our demos and presentation at this key computer vision conference.